1st heart – Hand punched from 160gsm Quality White Card. 2nd heart – Hand punched from white seed card. 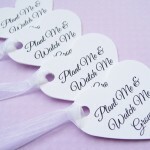 The 2 hearts are tied together with white organza ribbon and are 2 inches in size. Embedded seeds: English Daisy, Sweet Alyssum, Spurred Snapdragon, Corn Poppy and Black Eyed Susan. 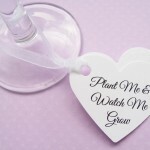 Detatch the seed heart and plant in a pot of compost or ground, cover with a layer of compost, water and keep moist and under suitable conditions, flowers will grow! Seeds germinate best when planted from spring onwards, once frost has passed. 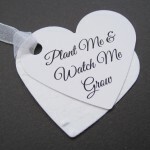 - Use as favours for guests, or tie them onto gift bags at many different occasions. 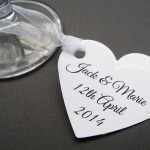 - Use as table settings or tie around the cutlery or wine glass to personalise your table décor. - Hang on wish trees where the guests write sentiments on the back of the hearts and hang them on the tree, an alternative to a guest book. Thank you for attending our special day! A date – wedding, anniversary, memorial.. 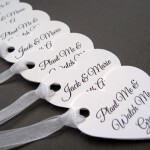 Individual names – If you would like individual guest names on each heart, please message to set up a custom listing.